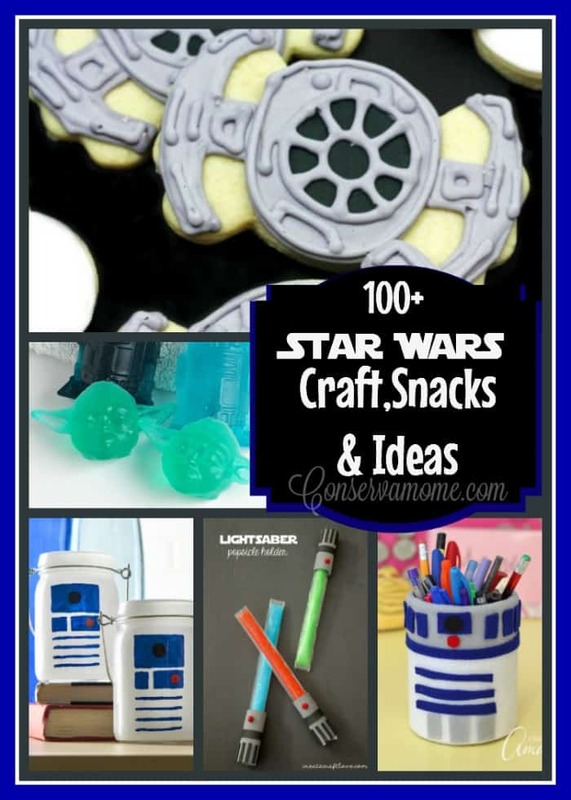 Here’s a 100+ Star Wars Craft,Snacks & Ideas for kids, adults and Star Wars Fans! Perfect for a fun party, event or just because. I have two boys who absolutely love Star Wars. EVERYTHING STAR WARS. So it was only a necessity to put together a ton of Star Wars Ideas in one place. Honestly though, can you ever really have too much Star Wars? 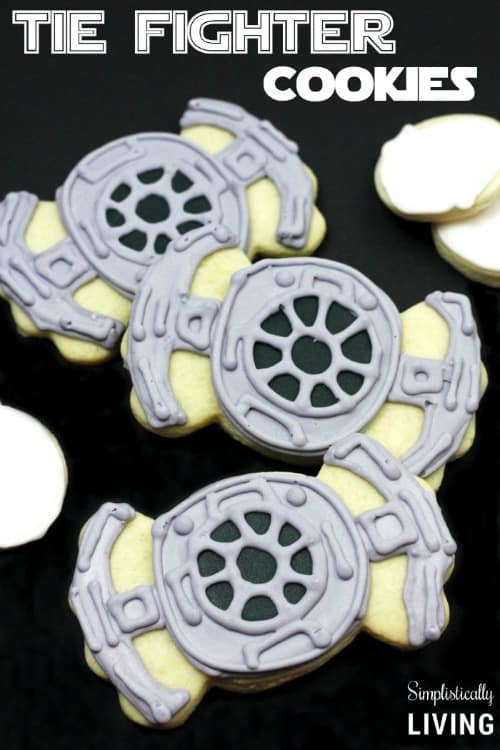 So as I searched the internet for the best out there, I was able to find 100+ Star Wars Craft,Snacks & Ideas . So head below and check out all the amazing stuff I was able to find! They are in alphabetical order to make it easier 🙂 Enjoy! Death Star Oreo Truffles by Sydney at Tastefully Frugal. Yoda Cupcakes from Alyssa at Arts & Crackers. So neat! Love those popsicle holders! Amazing, pinned it first thing, my oldest grandson (9) will FLIP. He adores Star Wars and is always trying new things – he’s done some awesome origami and some snowflakes, different things he’s looked up. I have no doubt he’ll find a ton to keep him busy with this super info. Thank you so much for putting this together and sharing. School let out last week here and Ian just so happened to spend the night so as soon as he wakes up I am going to have him get on my computer and then show him, then link it up on his iPad so he can get to it himself when he’s not here. These look like so much fun. My son would love them. I just got him Star Wars Laser Chopsticks. He has a blast with those. These are so stinking cute. I just got a set of Star Wars Ice Trays so I think I am going to make candies in them. My grandson is a big Star War Fan. What fun ideas for crafts with him! Very unique! wow! So many cool and wonderful ideas you have here, I love freezer pop holders and those cupcakes look delicious! So cute. I am making these with nephew. This is one of the BEST posts I’ve ever seen!!!! My 7 year old is obsessed with Star Wars (he may or may not get that from me 😉 LOL). I LOVE these ideas and cannot wait to share with him! 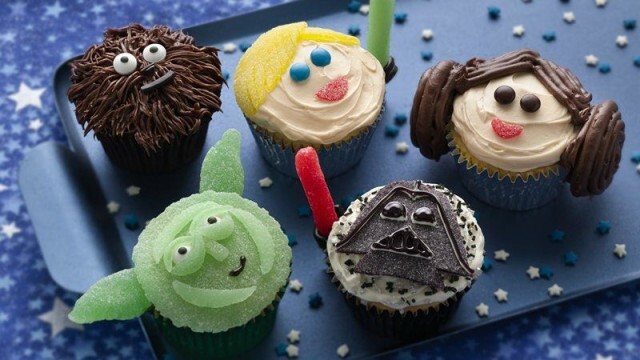 I love this nice list for Star Wars ideas and treats. Me and my nephew both love it, and I will be sharing this list with the people close to me who enjoy Star Wars as well. Wow,we have Star War fans here from 3 to 58 and i see many fun things here for them !! This is amazing. Thank you so much! It saves time from having to try to think of ideas to search around for. What a comprehensive variety of fun and creative activities. Any star wars fan would be delighted. How fun!! 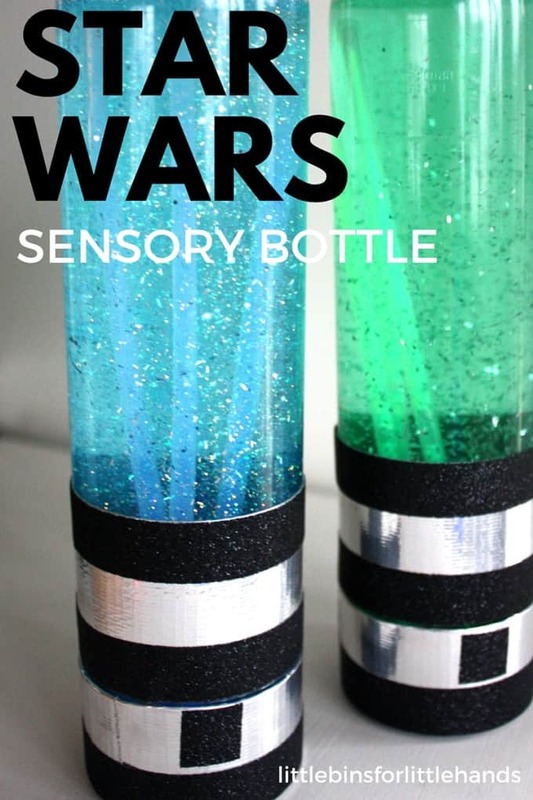 I love the popsicle light sabers and the sensory bottles!! Too fun!! These are so cool, I love them!! Star Wars will never get old. How fun! I will have to share this post with my SIL, her son is obsessed with Star Wars. This is perfect for those lovers of Star Wars. There are so many different ideas here. My little one is only two months but I will definitely be trying these when he gets older. I may even make some for my husband now since he is such a Star Wars fan! My nephew is really into Star Wars right now. I can’t wait to try out some of these crafts with him when I see him in a few weeks! This is great! We are a huge Star Wars loving family. Can’t wait to try these! Wow these are super cool ideas. We have seen all the old star wars many times but not the newest movie. My in laws have they love star wars too. I would love to nake these crafts with our kids and all our cousins. Thank you. These are all really fun ideas and I’m going to have to give some of them a try! Really cute! Especially the icicle pop light sabers. I love this! My 9 year old would too! Some of these are too awesome not to do. Thank you so much! We are Star Wars fanatics here and have two birthdays coming up…this is amazing! ? What a great assortment of ideas – especially love those cupcakes! Thanks for doing all the work – much appreciated! 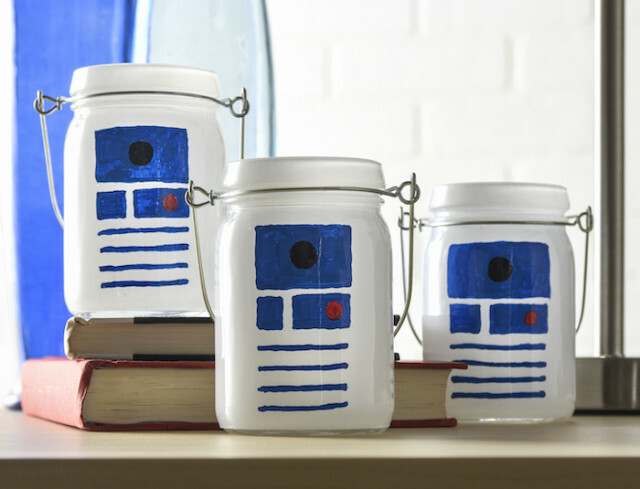 I can’t believe how many crafts and snacks inspired by star wars is out there. 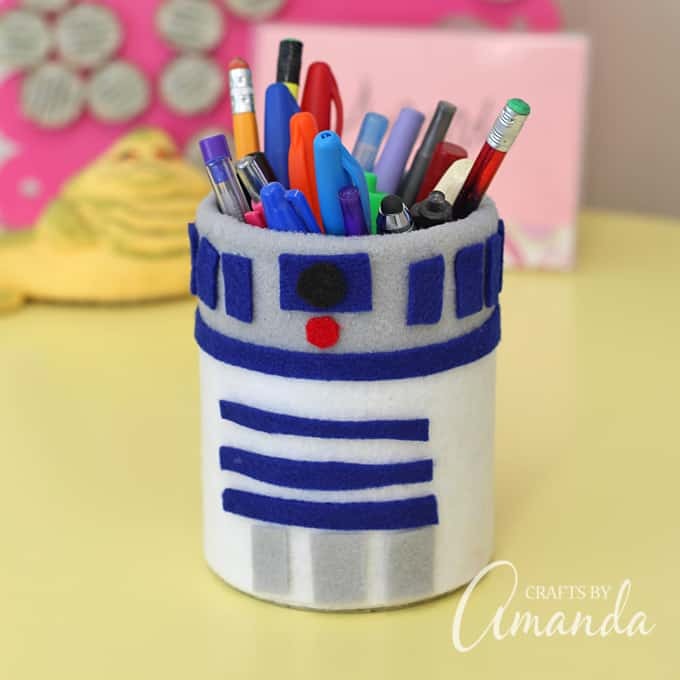 I really want to make that pencil holder, my desk is so boring! Not a crazy Star Wars fan, but these are good. And I love creative multipurpose for cookie cutter shapes. AH! 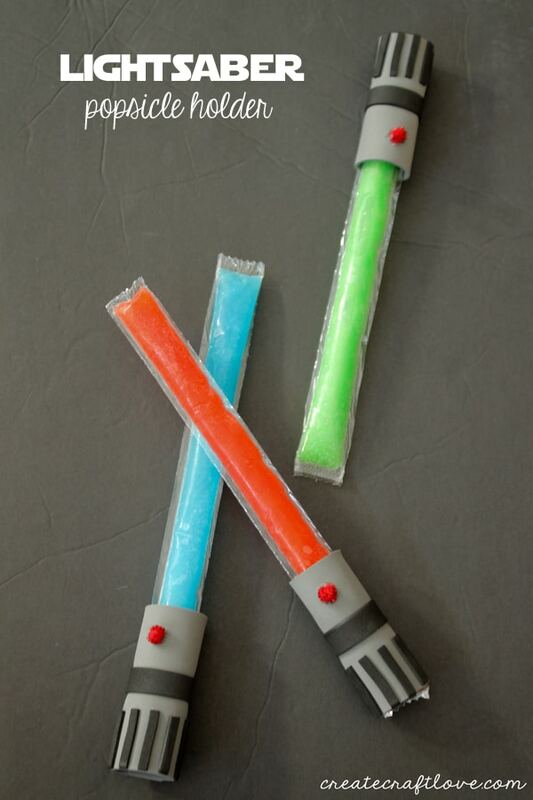 The light saber popsicle holder is super creative and cute! Love the cookies and cupcakes too! My hubby is a major Star Wars fan…. maybe I should throw him a themed birthday party!! lol! That is an insane amount of adorable Star Wars stuff. I admit, I’m not really into it too much. Didn’t watch it growing up and saw the original 2 maybe 3 a few years ago. Once I was explaining pretend to a little boy and said you know like star wars. Whoops! He thought it was reality! 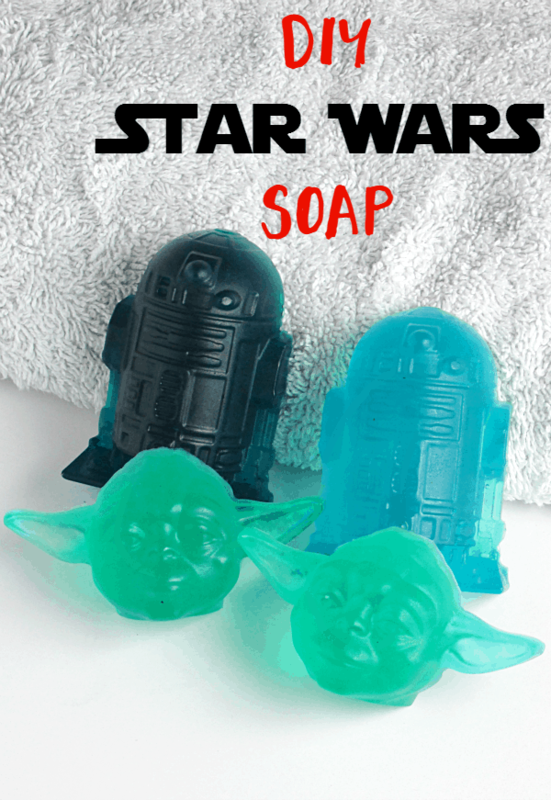 I like the Star Wars soaps. Lots of fun things here. I have an eleven year old star wars lover that might like some of these.